Hi and welcome to my day on the Island Batik Getaway Blog Hop. 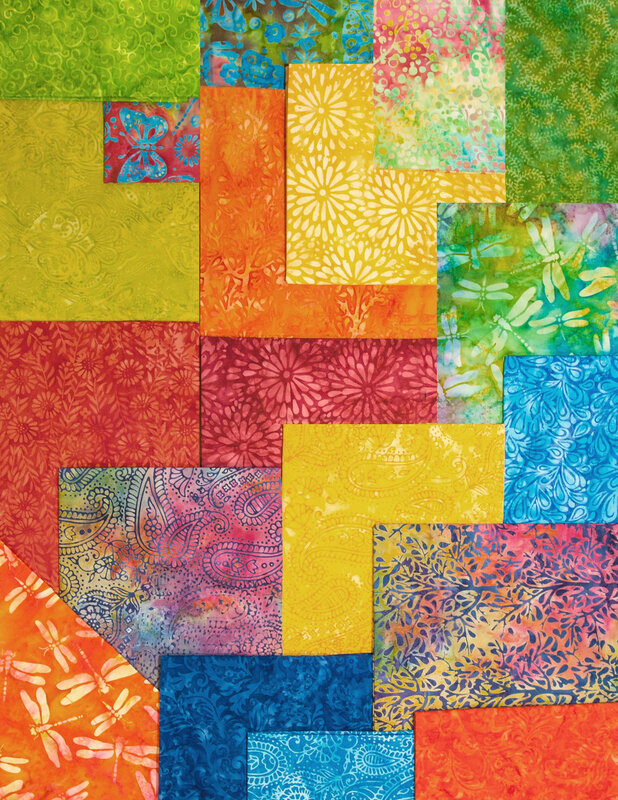 Each day during the hop, a different fabric collection is featured. Today, the collection is Fortune Teller. 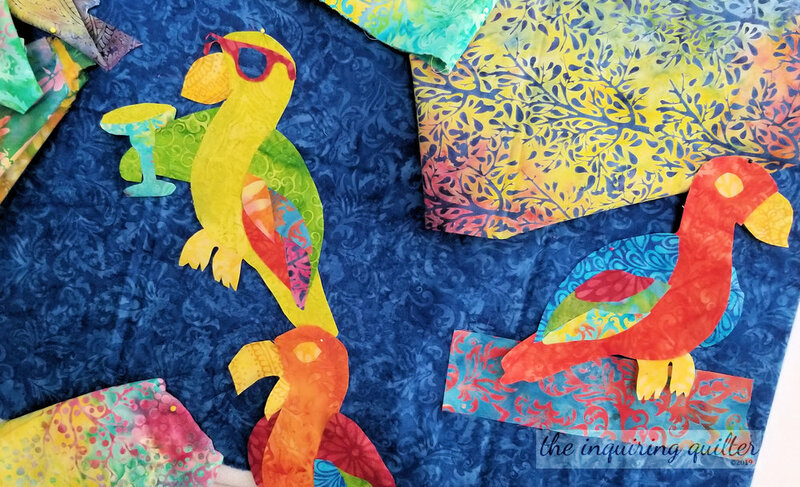 The fabrics in Fortune Teller are as bright and fun as a Mexican fiesta, and I used that idea as a launching point for my quilt design. Unfortunately, I was unable to get my quilt finished. I actually was on track to finish at least the quilt top, but life intervened. For those of you who follow my blog regularly, you know that my sister was recently diagnosed with cancer. Yesterday, she took a turn for the worse and I spent the day with her instead of finishing my quilt. I’m planning for my quilt top to be rectangular—so I’m going to be adding another strip of that lovely blue (#121818471) to the bottom of the blue background you see here. As you can see, I’m building two branches of parrots—the three large parrots you see here and two smaller ones. You can see the fabric I plan to use for the branches (121818540) under the far right parrot (although the branches won’t be as thick that strip shown here). You can also see the fabrics and the rough size of the tropical leaves I’m planning on adding to those branches. I’ll also be adding additional touches to some of the parrots, including sombreros and serapes. It’ll be a Parrot Fiesta! 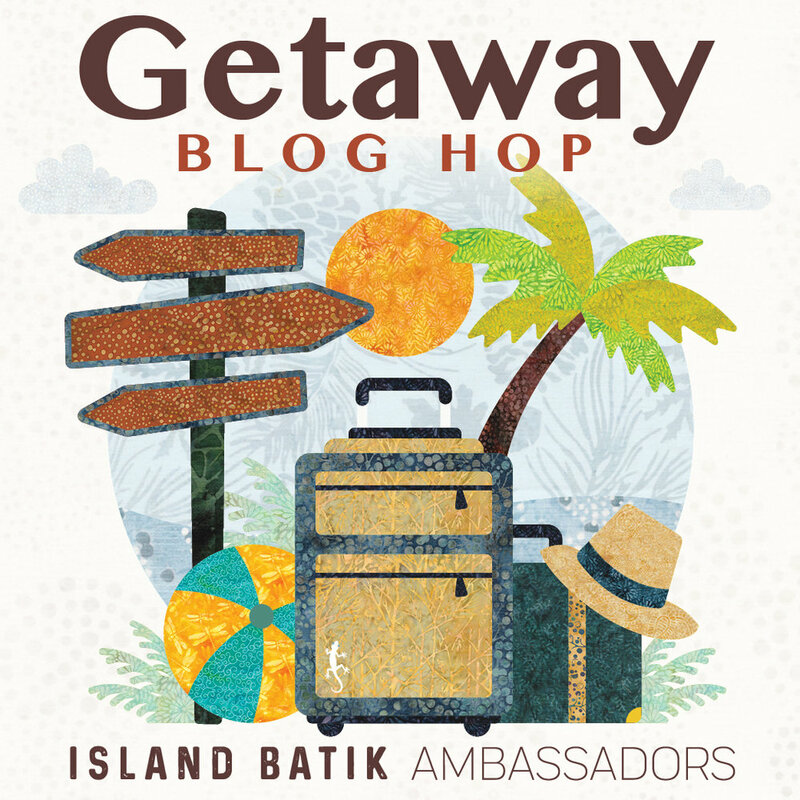 The Island Batik Getaway Blog Hop continues this whole month and there are lots of giveaways! First, I’m giving away a charm pack of Fortune Teller 5” squares. To enter, complete the Rafflecopter below. We have a winner! If you didn’t win, please follow me. I have frequent giveaways, especially for my weekly Wednesday Wait Loss. You’ll find ways to follow me at the top of my sidebar. Each of the Ambassadors is also having a giveaway, so be sure to visit them. You’ll find the links to this week’s participating Ambassadors below. If you missed last week’s list of Ambassadors, click here. First though, complete the Rafflecopter below to enter to win Island Batik’s incredible prize package! Please come back next Monday to see the progress I’m making on my quilt and to get the next list of participating Ambassadors.